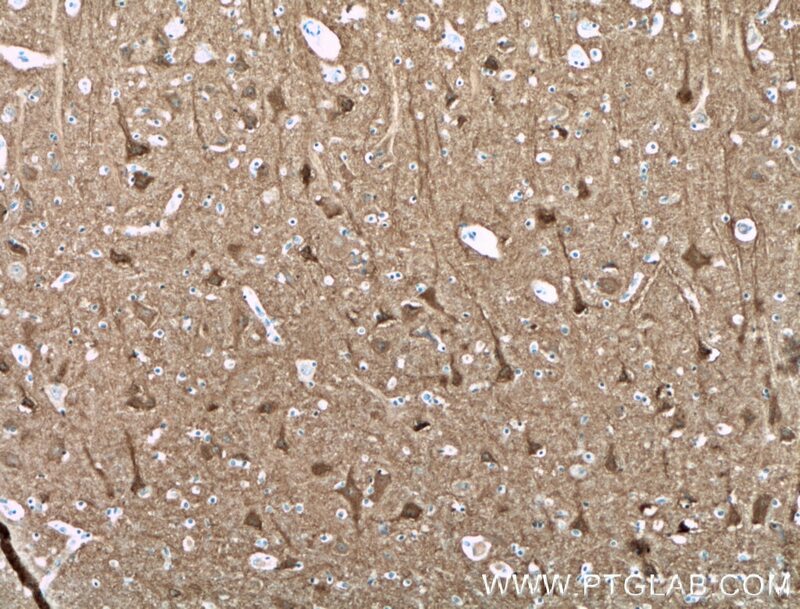 Immunohistochemical analysis of paraffin-embedded human brain tissue slide using 18149-1-AP( CPLX2 antibody) at dilution of 1:200 (under 10x lens) heat mediated antigen retrieved with Tris-EDTA buffer(pH9). 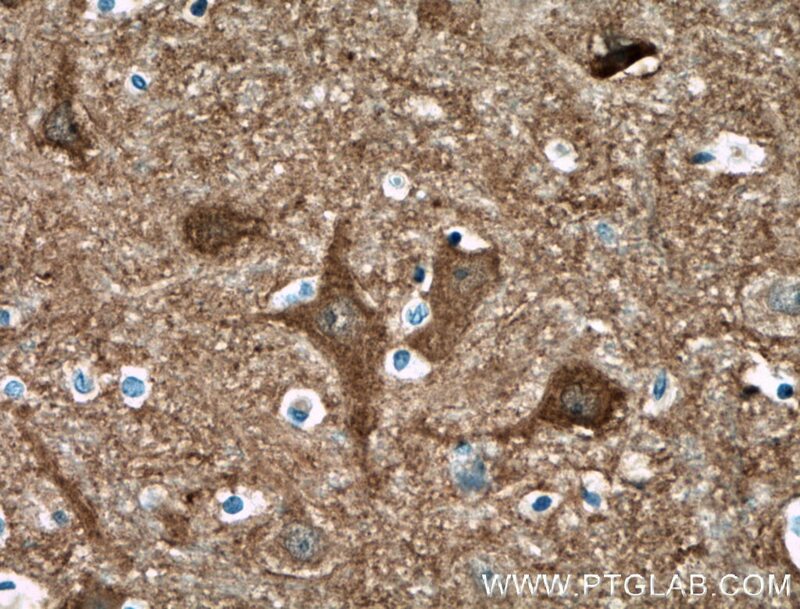 Immunohistochemical analysis of paraffin-embedded human brain tissue slide using 18149-1-AP( CPLX2 antibody) at dilution of 1:200 (under 40x lens) heat mediated antigen retrieved with Tris-EDTA buffer(pH9). 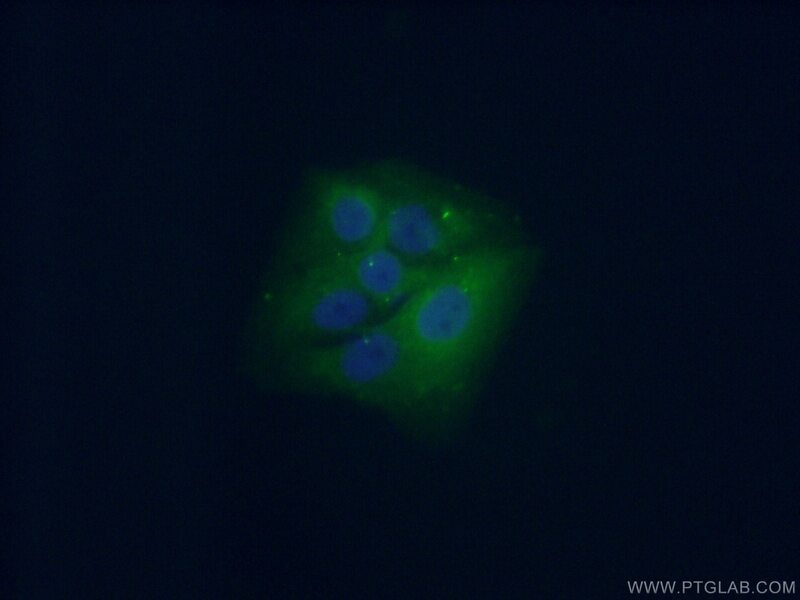 IP Result of anti-CPLX2 (IP:18149-1-AP, 3ug; Detection:18149-1-AP 1:700) with SH-SY5Y cells lysate 800ug. 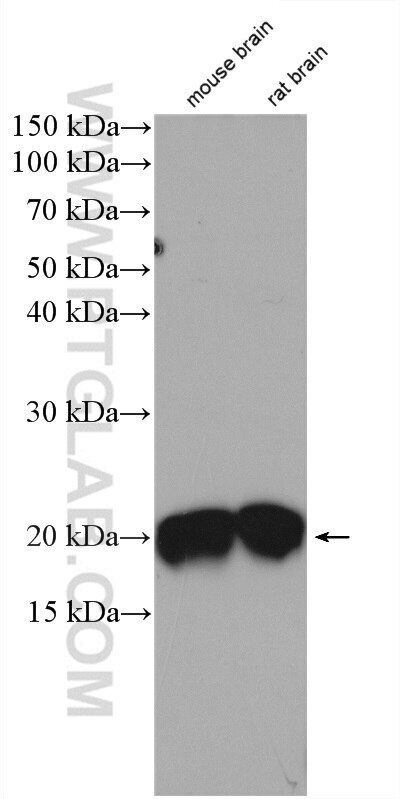 Complexins are soluble proteins that regulate the activity of soluble N-ethylmaleimide-sensitive factor attachment protein receptor (SNARE) complexes necessary for vesicle fusion. Neuronal specific complexin 1 (CPLX1) has inhibitory and stimulatory effects on exocytosis by clamping trans-SNARE complexes in a prefusion state and promoting conformational changes to facilitate membrane fusion following cell stimulation. Complexin2 (CPLX2) is a pre-synaptic protein believed to regulate neurotransmitter release from pre-synaptic terminals, it is downregulated in schizophrenic patients suffering from depression, animal models of depression and neurological disorders such as Huntington's disease in which depression is a major symptom. NOX2 Deficiency Ameliorates Cerebral Injury by Reduction of Complexin II-mediated Glutamate Excitotoxicity in Experimental Stroke. Widespread cerebellar transcriptome changes in Ts65Dn down syndrome mouse model after lifelong running. 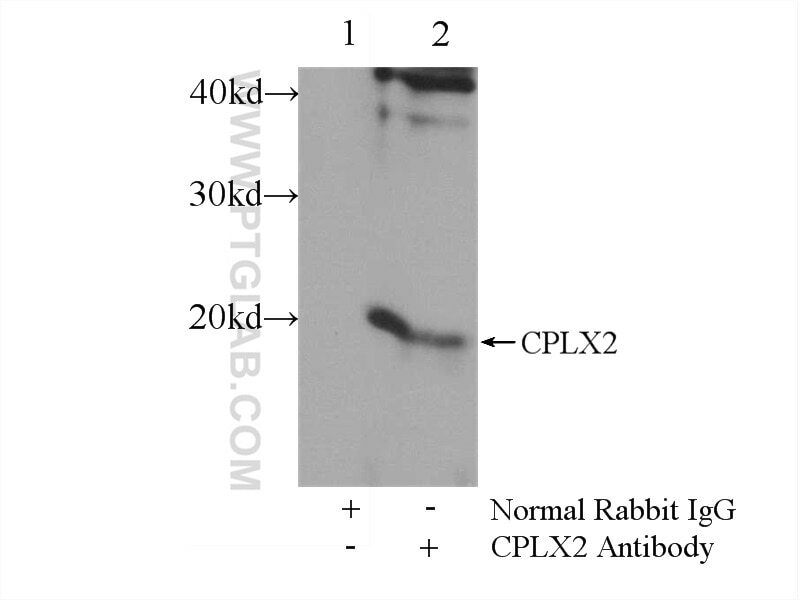 Complexin-2 (CPLX2) as a potential prognostic biomarker in human lung high grade neuroendocrine tumors.